You’re going to love this fresh and flavorful Vegan Spinach and Sun-Dried Tomato Pasta Salad! It’s so delicious, and can be served cold, warm, or at room temperature. Every Summer we spend a few hot and sunny days down the shore with our family. It’s nothing fancy, but it’s tons of fun and something I always look forward to. Because what’s better than cooking, drinking, eating, and laughing with the ones you love? Answer: nothing! It’s seriously priceless. Of course we also drive each other crazy! But isn’t that what family is for?! Anyway. I’m not much of a beach bum, so when the family heads to the shore, I stay back and do what I do best: COOK! And lucky for me, my aunt (who is like the best cook ever) is usually there by my side. We spend the afternoon sipping white wine, casually chatting, and cooking enough food to feed a small army. One of the recipes I learned to make this year was this super simple pasta salad! 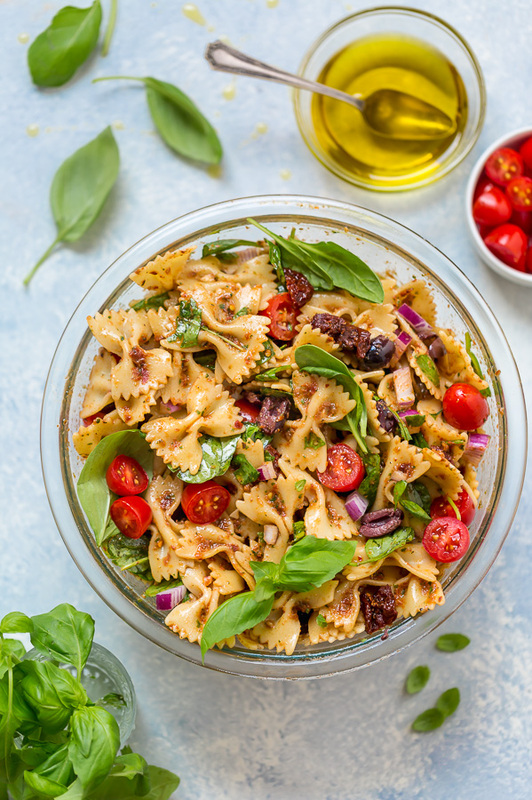 It’s loaded with spinach, basil, sun-dried tomatoes, grape tomatoes, red onion, and olives. And the dressing is a tangy vinaigrette that makes the salad super flavorful without weighing it down or making it soggy. Basically, this salad has got it going on in ALL the right ways and you’re going to love it. 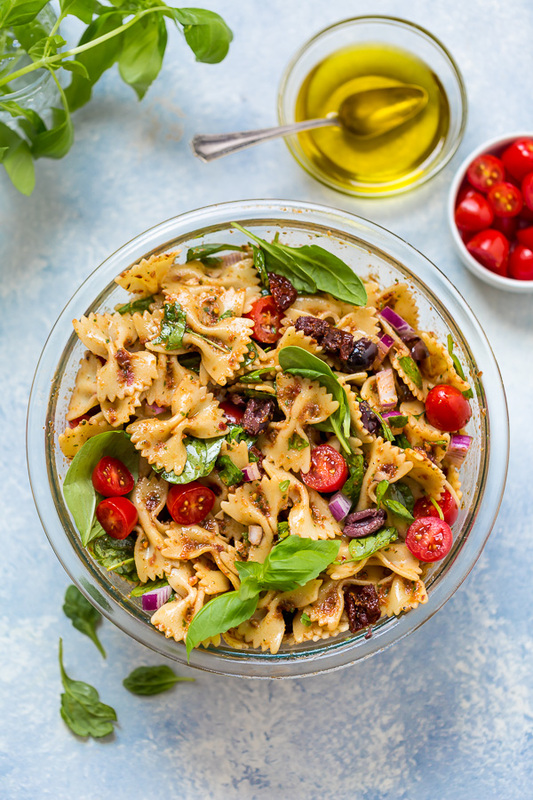 Make sure to buy sun-dried tomatoes that are packed in olive oil. I urge this because you’ll use the oil for the salad dressing! Can you use regular olive oil? Technically, yes. But it would be missing that sun-dried tomato infused flavor that makes the dressing extra. So just buy the oil packed tomatoes and trust me on this 😉 I’m pretty confident you’ll thank me after one bite! 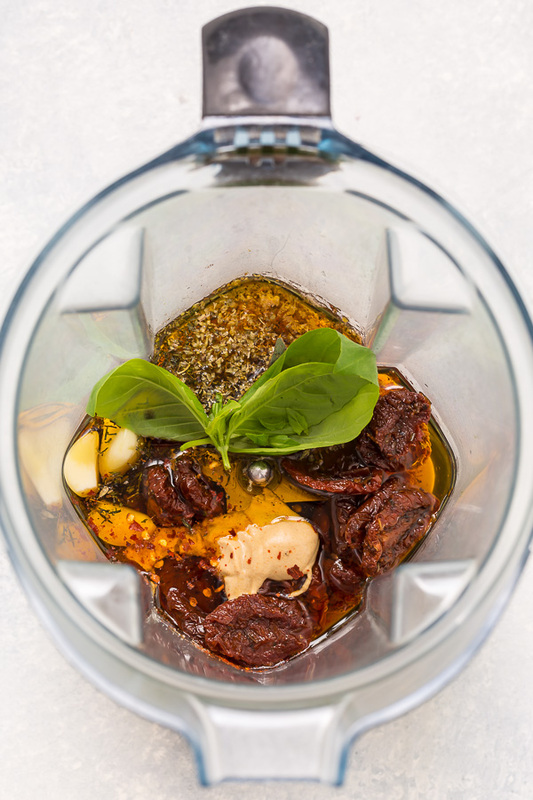 And if you don’t have exactly a 1/2 cup of sun-dried tomato oil, just add olive oil as needed. Because this is such a simple recipe, I highly suggest using the freshest ingredients you can get your hands on! Since the vinaigrette will soak into the noodles – and you don’t want them to get soggy – you should cook the pasta al dente. 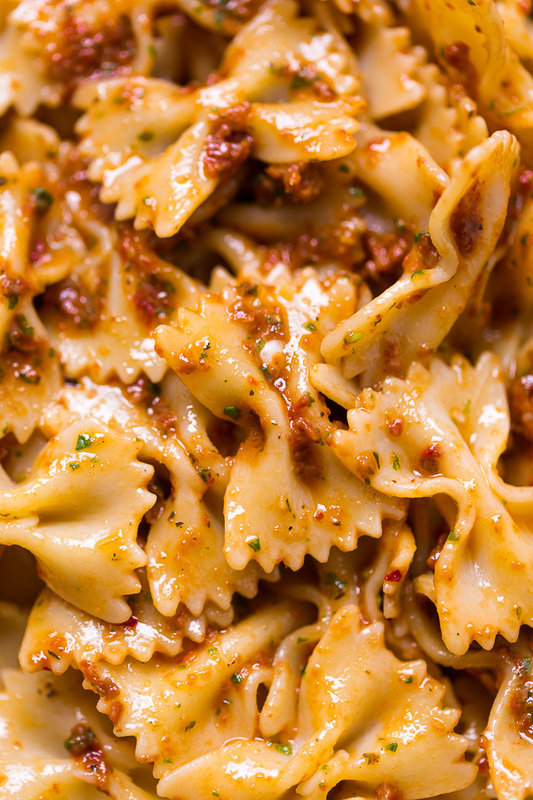 We use bowtie pasta for this recipe (AKA farfalle) but any small shaped noodle should work. I’ve made this with rigatoni and it was equally delightful! 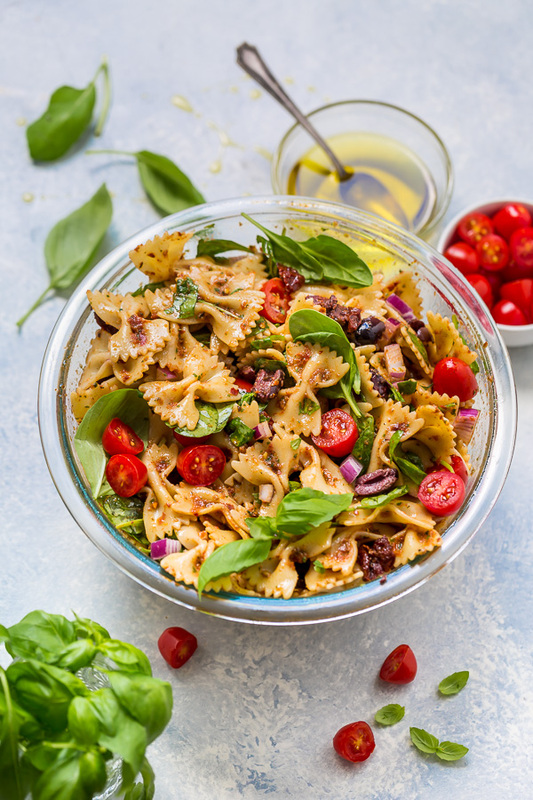 And finally, this is a great pasta salad for parties, picnics, and barbecues because it’s naturally vegan and could easily be adapted to be gluten free. It also keeps exceptionally well! We had a party in the backyard last week and this pasta salad held up for an hour… before being completely consumed by our guests haha. It goes FAST! P.S. If you really want to bulk this recipe up and you’re not vegan, feel free to add cheese, chicken, or even shrimp! Or – if you’re a veggie lover (like me) – add some marinated artichokes, asparagus, or even avocado. This is one of those base recipes you can adapt and really make your own 😉 Enjoy!!! 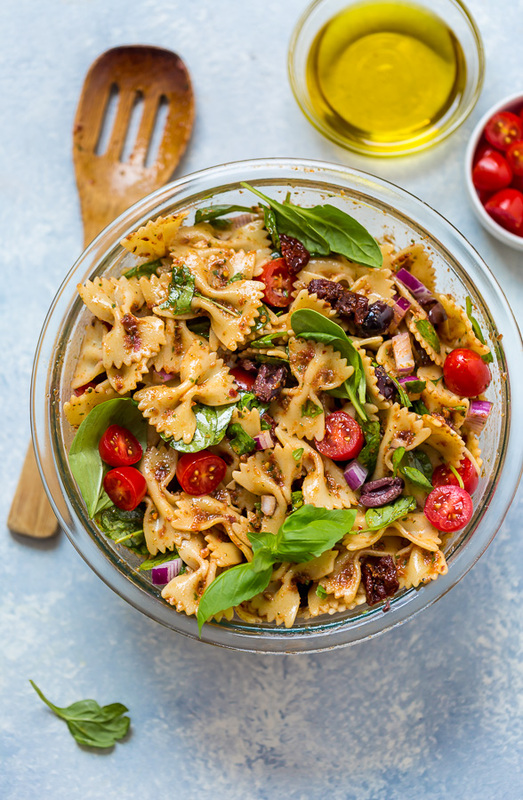 You're going to love this fresh and flavorful pasta salad! And it's delicious served cold, warm, or at room temperature. Try it once... crave it ALWAYS! Combine all of the ingredients in a blender or food processor and pulse until completely smooth. Taste and adjust seasonings as needed. Set aside. Place a large pot of salted water over high heat and bring it to a rolling boil. Add pasta and cook until al dente, 8 to 10 minutes. When the pasta has finished cooking, drain it at once and quickly rinse it under cold water until cool, about 1 minute. 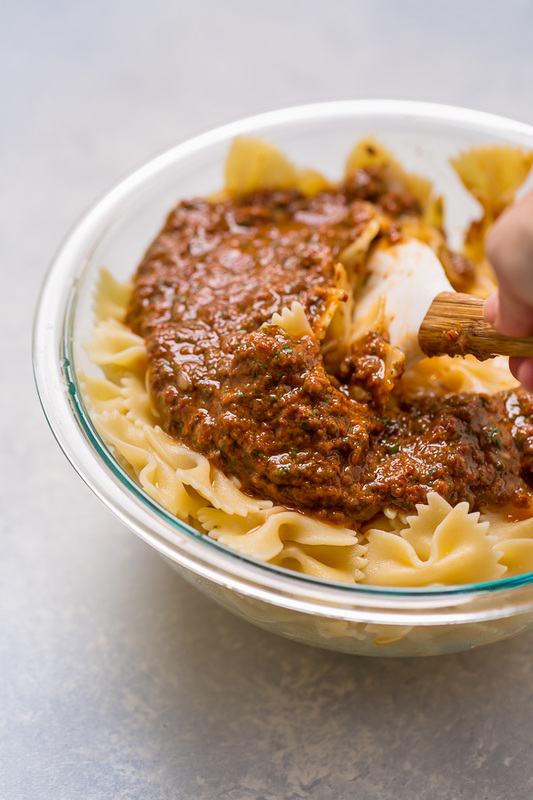 Place cooled pasta in a large mixing bowl and add the dressing, toss well to coat. 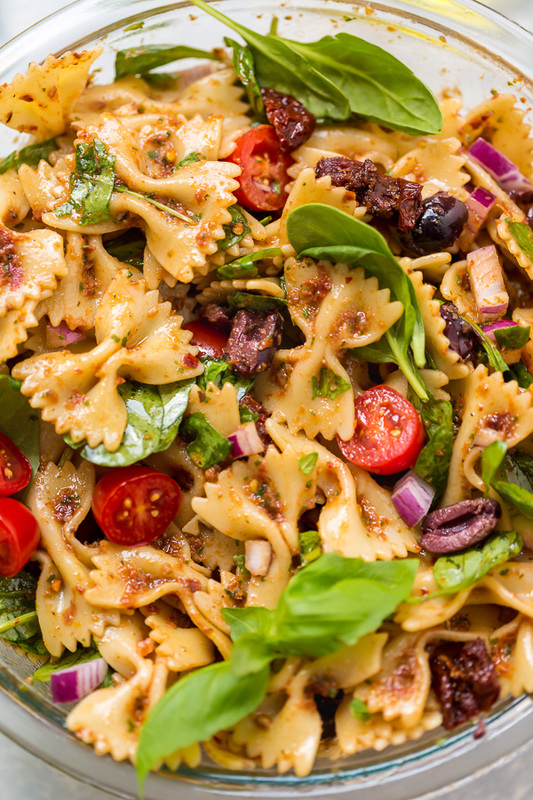 Add the sun-dried tomatoes, grape tomatoes, spinach, basil, onion, and olives and toss well to combine. Serve at once, or chill until needed. I would reduce the salt to 1/2 a tsp. 1 1/4 tsp is a bit much. Add a squeeze of lemon. Otherwise very tasty!